I may have commented before that biodiversity tends to increase as one moves to a smaller scale. If I haven't, I certainly should have. The number of small representatives of a group will almost always be greater than the number of large ones. And if one considers the molluscs, for instance, the diversity of large, eye-catching species is considerably smaller is considerably smaller than the diversity of the micro-mollusks that usually go unnoticed. Litiopids Alaba virgata crawling about on seagrass, copyright Ria Tan. 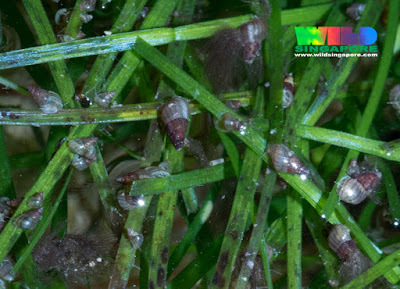 The Litiopidae are a group of marine gastropods that are found living among and feeding on seaweeds and seagrasses; though little recognised, they can be very abundant. They have high-spired, conical, translucent shells that reach about an inch in length in the largest species, but seem to be more commonly less than a centimetre. They belong among the larger gastropod clade known as the Cerithioidea and can be difficult to distinguish from other members of this clade by their shells alone. Most members of the Litiopidae are placed within the genera Litiopa and Alaba. The soft anatomy of the family is more distinctive (Houbrick 1987). Litiopids have a long, narrow foot with a median slit in the rear part of the underside marking the opening of a large mesopodial mucous gland. The sides of the foot carry several epipodial tentacles; in other gastropods with such tentacles, they provide a sensory function. A pair of long tentacles is also present on the head, which is produced into an extensible bilobed snout. A pair of small eyes is present at the base of the tentacles. 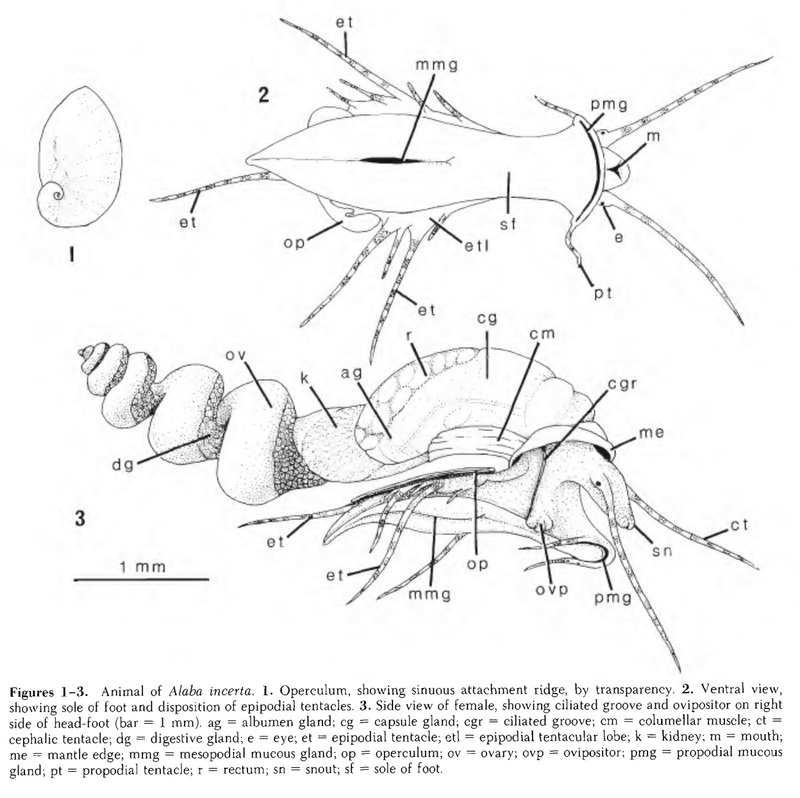 Soft anatomy of Alaba incerta, from Houbrick (1987). Litiopids glide about on the underwater vegetation at some speed; they are also able to glide upside-down on the water surface, hanging from the surface tension. The trail of mucus laid down by the mesopodial mucous gland functions like the drag-line laid down by a spider. If the animal finds itself torn away from its substrate, the mucous strand tethers it in place, and it can then haul itself back into place. Houbrick, R. S. 1987. 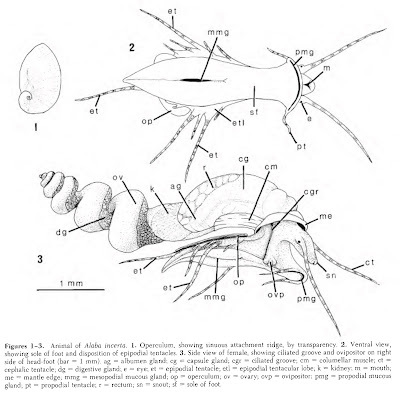 Anatomy of Alaba and Litiopa (Prosobranchia: Litiopidae): systematic implications. 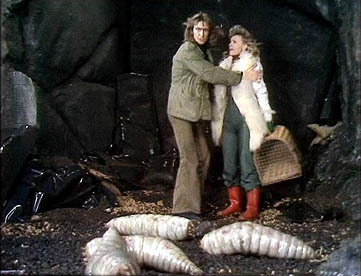 Nautilus 101 (1): 9–18. 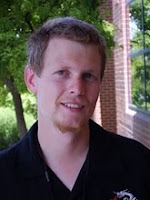 "The number of small representatives of a group will almost always be greater than the number of large ones." While I'm sure there must be counterexamples at sufficiently low taxonomic levels (a genus with two large and one small species, say), I'm finding it hard to think of any. Got any in mind? I also was intrigued by the idea of more diversity with smaller size. I think it does not apply to plants, at least I don't see that pattern ... ?? On the broader scale, there is a case to be made that an increase biodiversity towards smaller scales stops and begins to reverse once you get really small (somewhere below about the millimetre mark), probably because at these scales many of the barriers to dispersal effectively disappear. I believe it's a pretty highly contested subject, though, especially considering that it depends heavily on how we measure biodiversity in the first place.